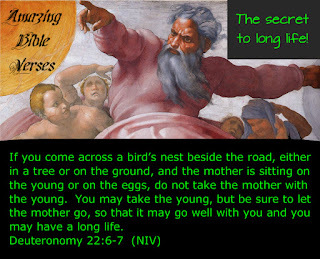 Debunking Christianity: Amazing Bible Verses: The Secret to Long Life! Amazing Bible Verses: The Secret to Long Life! Okay fellow atheists, can we just admit when we are wrong? I mean, all along we’ve been claiming that the Bible is not a scientific book - that it's the product of superstitious ancient men, not an all-knowing God, and yet here is clear proof that we have been mistaken! In light of this discovery, I have no choice but to relinquish my unbelief. In this short passage, quietly tucked away in Deuteronomy, is the very key to what so many scientific researchers are pursuing; the secret to extending the human life span. If you happen upon a bird nest-sitting, don’t mess with Momma. You can scramble the eggs, or fry the chicks, but if you want a happy, long life, let the mother go! As with many spiritual truths, this is so simple that it seems ridiculous. I mean, really ridiculous! What does being kind to mother birds have to do with extending the human life span? Remember, ours is not to question the mysterious ways of the Lord. Perhaps this is a test of obedience. Will we surrender our human reason and intellect to the Almighty? If we lay aside our pride and humbly embrace what seems like foolish nonsense, then God may see fit to bless us and extend our years on the Earth. Clearly, Yahweh closely identifies with mother birds, and they hold a special place in his heart, even if their offspring don’t. I am shocked that in all my years as a Christian, I never once heard a sermon preached on this passage! If I had, I would never have wandered from the faith. If only pastors, evangelists and authors would spread this teaching, then Christians would be proving the truth of their religion by the mere fact of their extraordinarily long and happy lives. Why hasn’t Joel Osteen or Rick Warren written a book about this precious truth? Christians are suffering needless early deaths from heart disease, cancer, and diabetes, when they could be rockin’ the nursing homes as centenarians, or older – all through the power of bird-kindness. Churches could set up healing gardens where members could walk a path, and ‘happen’ on strategically-placed nesting birds, thus providing them a chance to practice faithful obedience to Scripture, thereby lengthen their lifespan. Medical doctors and scientists everywhere would sit at the feet of believers, to learn this wonderful knowledge. Who knows, this could even trigger a world-wide revival which would usher in the return of Jesus. The Bible IS God’s science book, and it is powerful! Step out in faith today.